The president of Djibouti has secured a third term in office after a landslide election victory, despite recent protests against his rule. 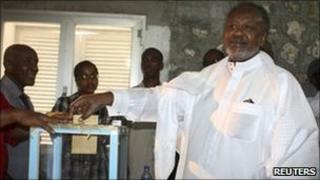 Ismail Omar Guelleh has won 80% of the votes cast, according to the country's electoral commission. The opposition had urged a boycott of Friday's polls, alleging irregularities. However turn-out was reported to be high, with almost 70% of the 150,000 people registered casting their vote. The leader faced only one challenger, former Constitutional Council head Mohamed Warsama Ragueh, who ran as an independent and garnered about 19% of votes, the election commission said. In a televised address, Mr Guelleh, 63, called on Djiboutians to unite to overcome the challenges ahead together. Earlier this week, the leader told AFP news agency that he would not seek a fourth term in office if he won the elections. The East African nation of Djibouti has a population of only about 800,000 people, but is strategically important. The country hosts the only US military base in Africa, as well as being the base for international navies fighting pirates off neighbouring Somalia. Last year, parliament amended the constitution to allow Mr Guelleh to seek a third term in office, sparking an opposition outcry. Some observers cast doubt on the fairness of the elections, saying they were uncompetitive. Democracy International's country leader in Djibouti, Chris Hennemeyer, told the Associated Press that Mr Guelleh's re-election was never in doubt, and said the fact that the government released results within hours of the polls closing was proof of that. The opposition called street demonstrations in February, inspired by the uprisings in North Africa. At least one person, a police officer, died, but the authorities managed to control the situation by arresting some of the protesters and briefly detaining some opposition leaders. Mr Guelleh's family has governed the Red Sea city state since independence from France in 1977. Known by his initials IOG, Mr Guelleh has supported Djibouti's traditionally strong ties to former colonial power France. Yusuf Garaad, from the BBC's African Service, says during his time in office he has also developed a close relationship with wealthy Arab rulers in the Gulf, helping him to attract investment for ambitious projects.